Susannah was invited to do the decorations for the Holiday Open House at Carolina Preserve, the Del Webb community located in Cary. 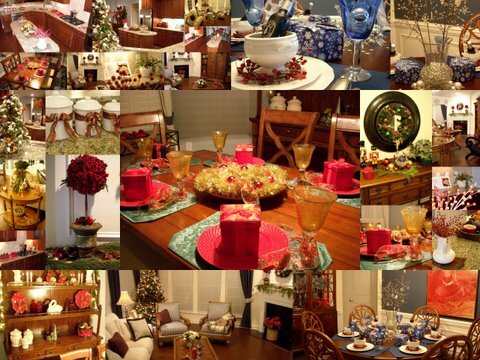 She used the basic accessories in the model (china, glassware, placemats, etc), and supplemented with specialty items from her own collection. The rest of the holiday materials were purchased at the Dollar Store, Michael's, Target, and Sam's Club. To see a slideshow of this photo collage, click here.